Have you been searching for new helm pads of late? 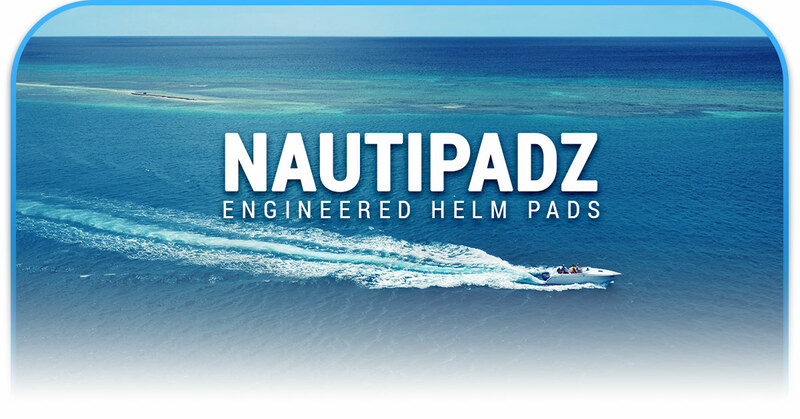 Well, look no further than Marine Customs, as we are now an authorized dealer of NautiPadz. What are NaudiPadz you may ask? They’re constructed from high-density polyurethane for ultimate comfort over rough waters and high speeds. NaudiPadz are held in place with a replaceable pressure-sensitive adhesive and, best of all, are built to last under the harshest of conditions. Not to mention, each NautiPad comes with a three-year limited warranty to ensure peace of mind. There are plenty of helm pads available today. So why go with NaudiPadz? Let’s start with the fact that they’re made in America. Every aspect of the NautiPadz manufacturing process is sourced in the U.S., so you know the product is of the highest quality. Then there’s the overall look of NautiPadz. Have you ever browsed for helm pads only to see that the options just don’t fit your style? There’s no need to worry about that with NautiPadz. 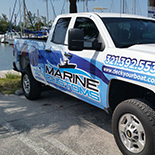 Their team understands that your boat is a reflection of your personality. The same should be true for your boat’s accessories. Why settle for the same boring helm pad that everyone else on the water has for their boat? The team at NaudiPadz believes that comfort and style go hand in hand. It’s why they offer a wide variety of solid colors, patterns, and graphics to suit your style. NaudiPadz makes ordering an absolute breeze. Each helm pad comes with adhesive backing for positioning. 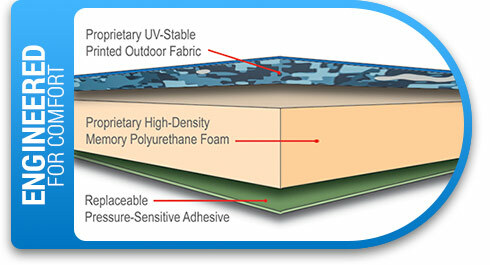 Keep in mind that replacement adhesive backing is available separately. When you’re ready to order, just let us know whether you prefer a small or a large one. Then take your pick from Mutton, Redfish, Sailfish, and Desert Camo Pad options. It’s as simple as that. Note: These NautiPadz are currently only available in one size (16 inches x 39 inches). 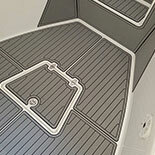 Whether your boat could use NautiPadz or non-skid decking, be sure to turn to Marine Customs. We are a custom fabricator and installer of marine non-skid decking. 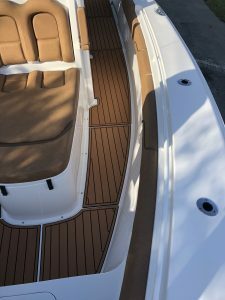 Maybe you’re thinking to yourself, “Why would I need new boat decking?” The next time you take the boat out, take a long look at it. Are there unsightly spider cracks, button snap holes from old carpet, or other surface imperfections? 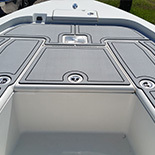 If so, then now is the time to enhance your boat’s safety, comfort, and overall appearance. 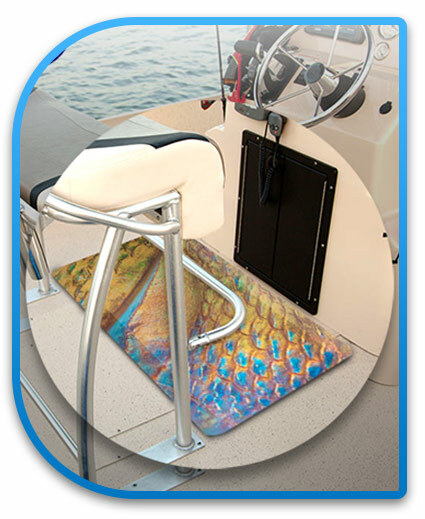 When you come to us, we are able to provide a totally custom and unique non-slip decking solution for your boat. Never will we use a “cookie-cutter” approach in any of our services. 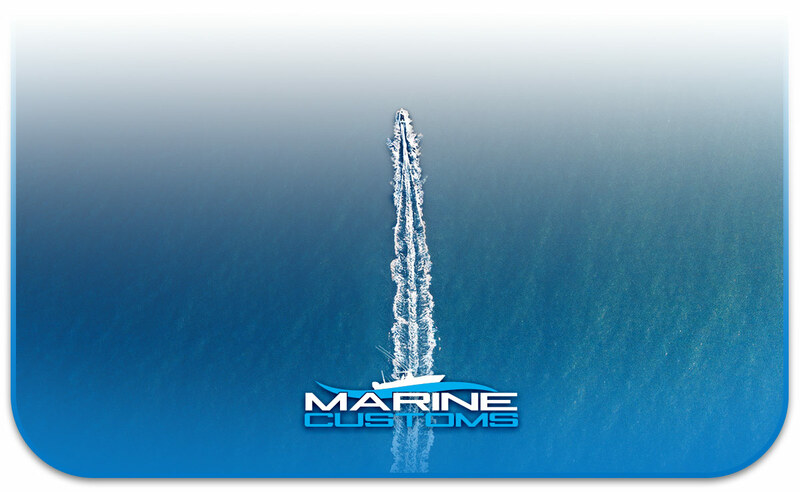 Our team here at Marine Customs literally has your boat decking needs covered. From NautiPadz to high-quality boat decking, see what we can do for you by contacting us today.